Majuro Atoll as seen from the air. It's low tide and the hard limestone part of the reef is exposed. The atoll is the tip of a limestone spire some 10,000 feet tall. An extinct volcano sank into the ocean millions of years ago. As it sank the coral kept building their homes all the way to the surface. As high as the breakers would keep them wet at low tide. 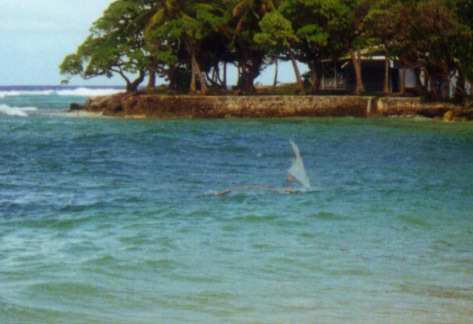 Marshall islanders have lived here for more than a thousand years. 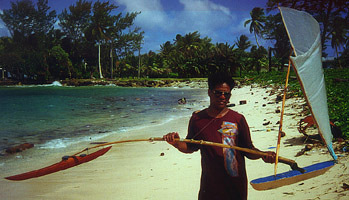 Drawn by the jobs and services that are concentrated here, some 40,000 people now live on this particular atoll, Majuro. On the windward side is a bay called "Riwuit Corner". This is where people race their toy canoes, which they call "riwuit". Roll the 'r' and say "ree-wut". This riwuit in the Majuro Alele Museum was built by Wilson Compass. He won the 1999 national race with it. It's early in the day and Anthony Maidher has come to Riwuit Corner to try out his new riwuit. There's just enough wind to make sure it steers itself well. Some little boys are waiting to catch it before it hits the rocks. Later in the day, the tide has come up a bit more, the wind has increased, and a good day for sailing has developed. The Republic of the Marshall Islands (RMI) capitol and government buildings are just down the road. Some of these men are leaders in government as well as leaders in riwuit racing. 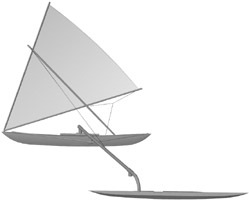 A riwuit when properly set up will steer itself in a straight line relative to the wind. When waves hit it and knock it sideways it will swerve back and go the right way. When gusts of wind come it will stand up and zoom away with incredible speed, still on course. UFO? During the independance day sailing canoe races this large riwuit came zipping across the race course. It was almost as fast as the big canoes. There was cross-lagoon riwuit race that same day. It took them only 15 or 20 minutes to cross the five miles of lagoon. Some boys teach me how to tune and sail my own riwuit. Iroij Michael Kabua won the 2000 Independence Day race with this riwuit. He kindly let me measure it and put the plans online. There are lots of Marshallese people in Springdale Arkansas and Costa Mesa California. 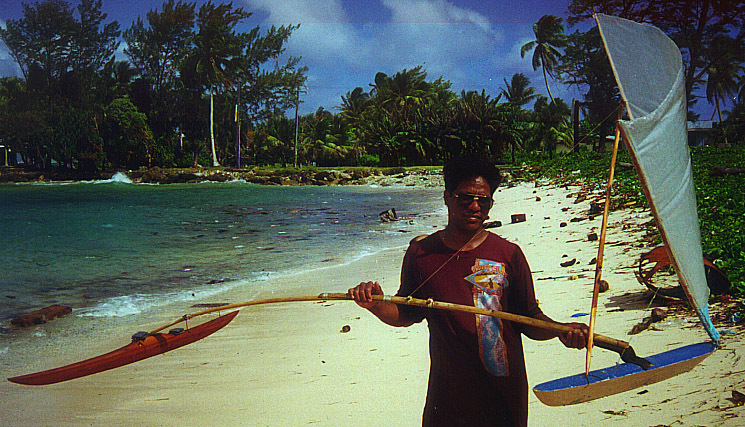 Ask one of your Marshallese friends to show you how to build and sail a riwuit.